I’m a little tired of exhibits and monuments, etc., and being overscheduled. I need an afternoon like I the one I spend in the Batignolles. It is very quiet here. Removed from the hustle and bustle of Paris. If you’re looking for a lot to do, this is not the place. There are a few nice shops, but shopping is very limited. And ditto, the restaurants. A casual vibe. Not even much traffic. I walk up and down Rues Nollet, Lemercier and La Dames. Don’t see much. So I stop at Sans Gêne for a little lunch and drink, see previous post. I’m tempted to split at this point, but I figure I’m here, what the heck. So I head down Rue Des Moines to see what the Square des Batignolles is all about. Some shops and restaurants ring the entrance to the park. A monument-type building is in the center, as there are everywhere in Paris. I’m feeling jaded today, so I don’t wander over to see what it’s all about. I’m allowed. 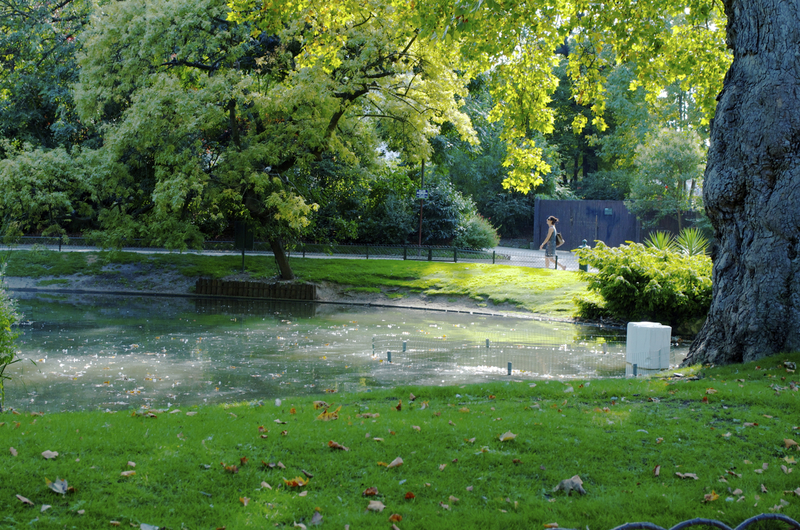 The real “action” in the Batignolles is in the lovely park. As I enter, I see a path descending into a pretty pond, grotto-like. 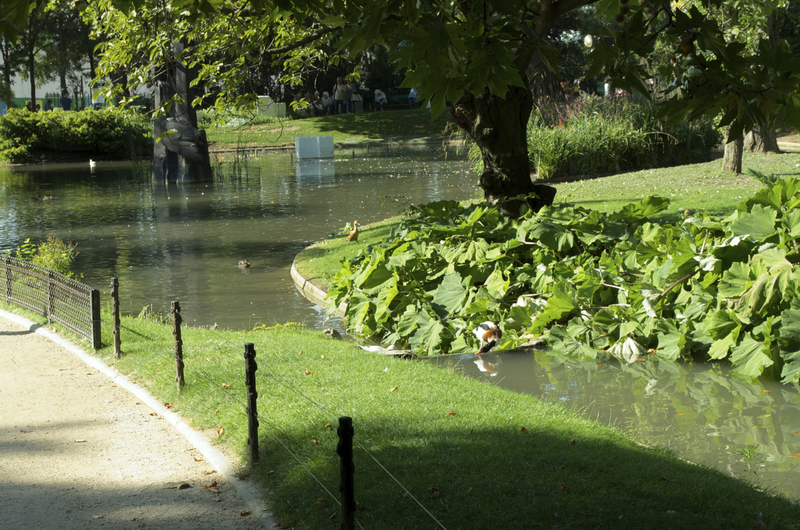 Then a peaceful stream running through the center with swans. After watching the swans for a while, I hike up the path to the observatory. There isn’t much you can observe from it, but it is quiet up there except for one guy who gets that look on his face like he’s going to try to pick me up. Parks are major pickup places here. I’ve been hit on nearly every time I’ve been painting in one. I shut the dude down and head over to see what’s on the left. This park keeps revealing itself: A play area. 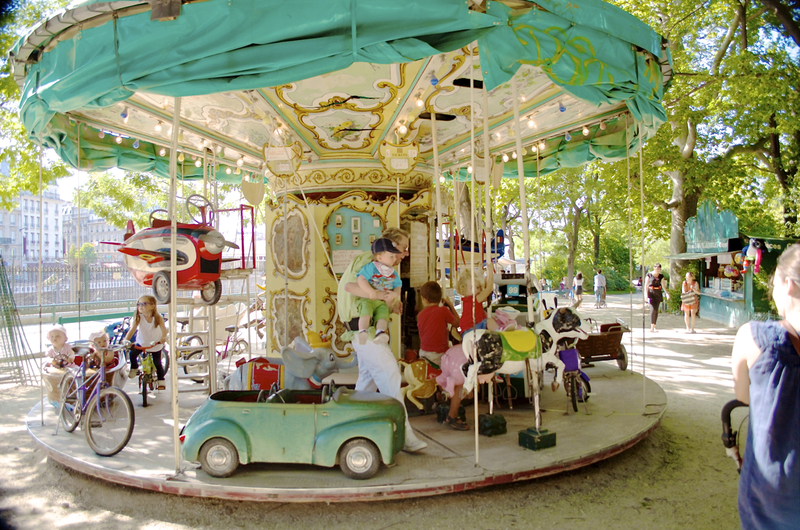 And a cute little merry-go-round, with a kindly older gentleman who runs it and looks out for the kids. He scoops them up in his arms if they’re scared and returns them to the parents. Adorbs. Toddler gets nicely returned to mom. I love you, Guy Who Operates the Carousel at Batignolles Square! From there, I head to the back of the park, where there are a bunch of older guys hanging out. Some play chess and cards. But most are playing Petanque, an outdoor bowling game similar to Bocce ball. Short story: they throw a small ball out, then they each stand in a small circle and throw weighty metal balls toward the the red ball, attempting to get closest to the pin, sometimes knocking their competitor’s ball out of the way. They get two chances. The mood is relaxed, but they take it seriously. Distances are carefully measured to determine who is closest, sometimes with a measuring tape. Techniques abound. Some crouch; some go from a crouch to standing; some stand. One guy stands and throws overhand; he’s got a wicked knockout move. The game appears to require pretty good balance. Unlike in the States, there doesn’t appear to be any smack-talking going down between the guys. There are two guys who appear to be the best players. The more colorful of the two notices I have a good camera and tells the other guys. I watch for about a half hour, just enjoying beautiful day and the action. There are quite a few other observers as well. Then he wanders over in his salmon-colored pants to chat me up, which is sadly limited by my lack of French skills. I enjoy characters, and he appears to be one. But I ask if it’s okay if I take photos. I don’t want to disturb their game or make them feel self-conscious. He says, “oui,” and tries to help me by making the guys not turn their backs to me. This embarrasses me, and I tell them, “no, no, it’s okay.” I like candid photos better than staged, anyway. If only he could have gotten me some sunlight into that shade, though! From a crouch to standing. Petanque in the Batignolles. Competition is tough. The Batignolles. Surveying the situation. The Batignolles. Playing cards on a pretty day. The Batignolles. I love seniors, and I love this game and the camaraderie. I snap a few photos, then head over to sit on a bench for a while and just chill. Probably the prettiest park I’ve been in here, though there are many pretty parks. Thank you, Batignolles, for refreshing my spirit. So on Pinterest I see a lot of pictures of carousels, most of which seem to be located in Paris. Would you say there’s a lot there considering the only places you seem to see them in the States is at carnivals? No, the only other one I’ve seen has been at Les Tuilleries. At a carnival. The Ferris wheel at Les Tuilleries is awesome, and there’s a swirling rocket thingie that’s huge, too. 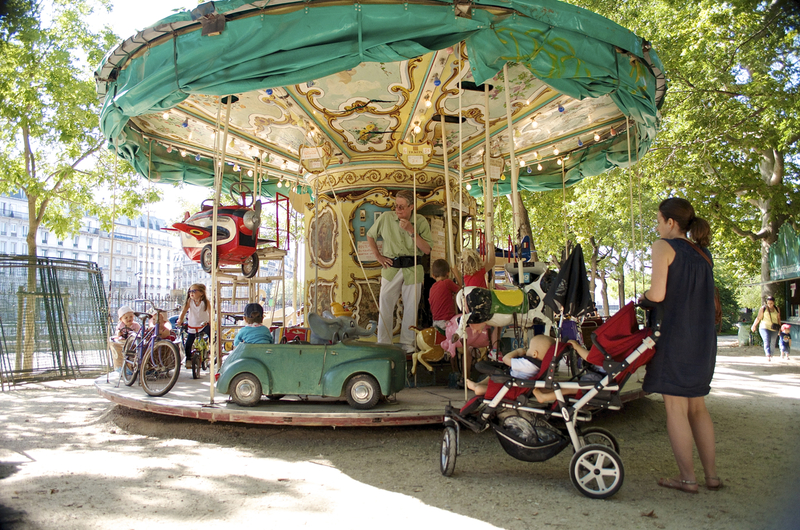 There may be more carousels in Paris; I just haven’t personally seen them. But I have been to many parks here, as well as the food, flea and artists markets, so … I’d think if there were a lot around, I might have seen more than two. Maybe there was one over in the 16th in that park by the Marmottan; I don’t remember one, though. If they’re in Monmartre, then that explains why I’ve missed them. Hardly spent any time there at all. Saw a tiny one at the Bastille market this morning! And another one at the metro entrance Saint-Paul. Guess I didn’t notice them before because they’re tiny and modern, not very charming at all.